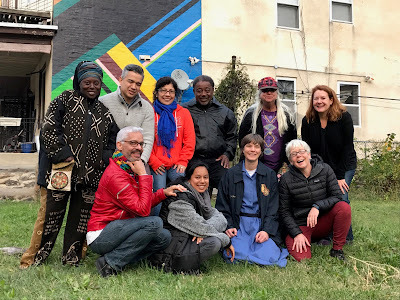 After meeting in Philadelphia this November we've determined the working rules for the Community Perspectives Researchers (also known as the Independent Community Based Organizations or ICBOs). -We will strive for consensus and embrace solidarity and mutuality among ICBO members. -Transparency and honesty are expected among all ICBO members and collaborators. -All members will be kept informed at all times and will have multiple opportunities to weigh in and provide input ahead of deadlines. 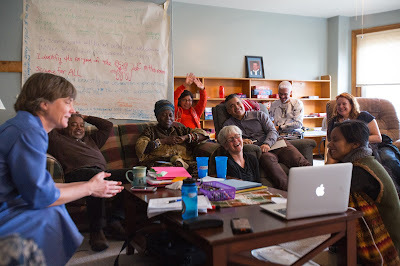 -All ICBO members will be included/invited to meetings that affect our collective work. -All ICBO members will have access to research findings in all phases of the research process. -First authorship is determined by niche/topic/area of expertise; who is taking the lead; who might benefit the most; or alphabetical order. Transparency and honesty are key. -One ICBO representative will take on the role of coordinating any requests for presentations stemming from our Community Perspectives Research. This role will be held for 4 months and then we will rotate this responsibility. Fanny Villarreal has taken the role of the ICBO coordinator until April 2018. -We will make major efforts to ensure ICBO participation/representation in Community Perspectives research presentations to guide and interpret our work and messaging in the right manner. Let the ICBOs speak for themselves. -Every member of the ICBO research team and participating community-based organizations will have a copy of all our findings, publications, and presentations as soon as they available. Each member will have a printed version of our standard research poster of results and share as they see fit. -The posters, presentations, and publications will always acknowledge the authors and participating community-based organizations and be clear about who has done this work. -The ICBOs will always speak for themselves. 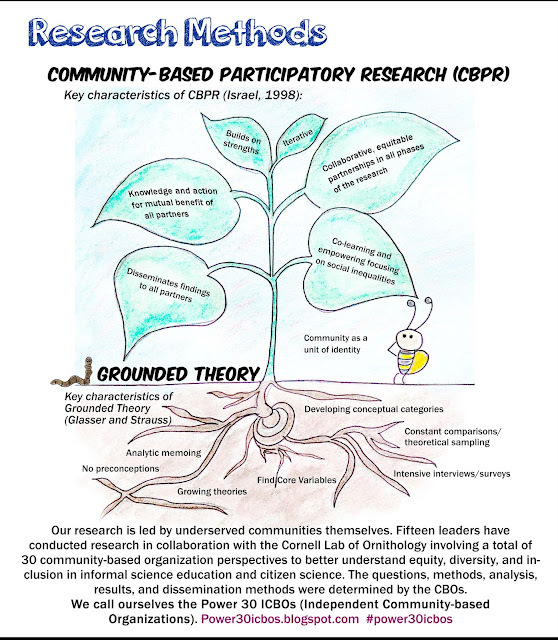 The research should be shared broadly without requiring in-person representation from dominant-culture institutions, including the Cornell Lab of Ornithology. -The ICBOs will always post from the heart. 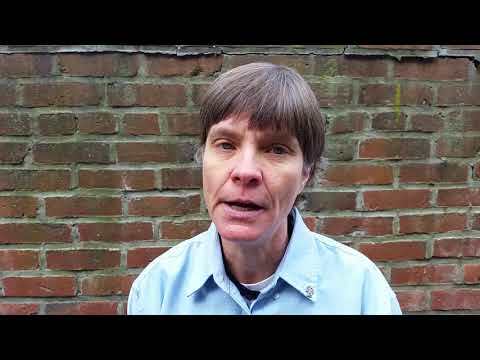 -Blogs and videos are democratizing tools to share our community perspectives and the work we do. -We demand self-reflection, transparency, and honesty in understanding motivations of our work. -We demand self-reflection, transparency, and honesty in understanding who will ultimately benefit from our work and from products of our work. -We focus on social inequalities, work for social change, and believe the primary benefactors of our efforts are the communities we represent. -We expect mutual benefit of all partners. 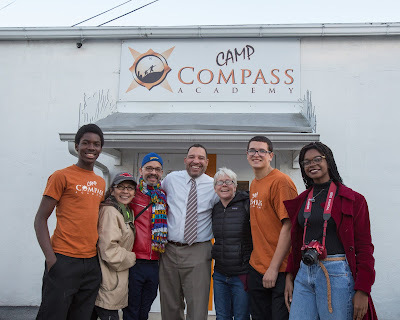 On Halloween, on their way to the ICBO meeting in Philadelphia, José Miguel, Fanny, Marilú and Karen stopped in Allentown PA to visit Camp Compass, one of the lead community-based organizations in our research. 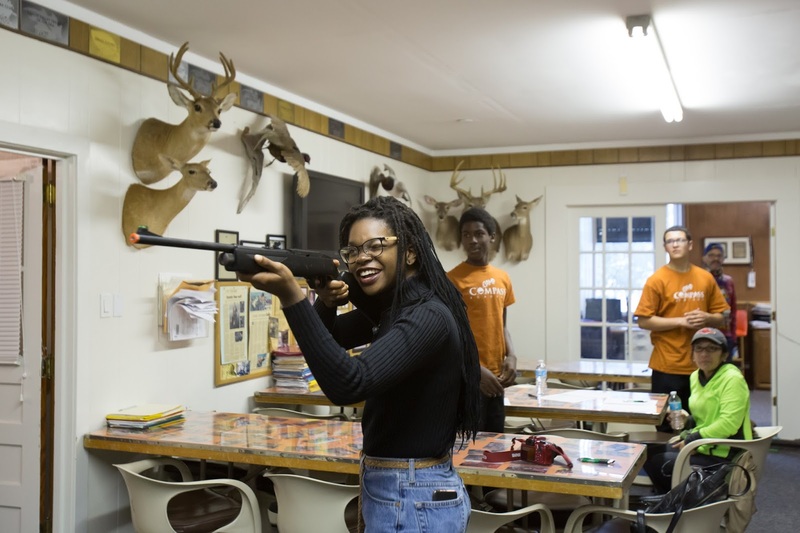 The nonprofit organization for urban, disadvantaged youth, fosters self esteem through hunting, fishing, tutoring, and social guidance. They arrived at 5:30pm and John Annoni, the program's leader was waiting in the parking lot with three of his students. Camp Compass is not easy to find. It is in an unmarked alleyway, at the back of a carpet store. From the outside it looks unassuming and simple, and on the inside it is home. 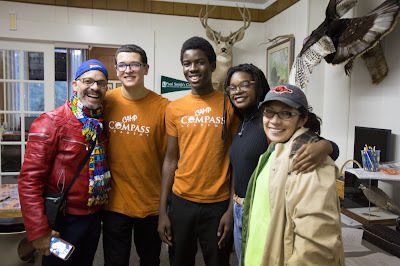 The power of Camp Compass becomes evident as soon as you begin to talk to one of the youth. The three students introduced themselves and took charge of the tour. These youth are confident and strong (in a way rarely seen in youth their age), while at the same time showing a gentle, patient, kindness towards newcomers and each other. There's something different at Camp Compass -- a culture of acceptance and self worth, and John's steady, unwavering belief in his students comes through boldly. Everything at Camp Compass is about the youth. 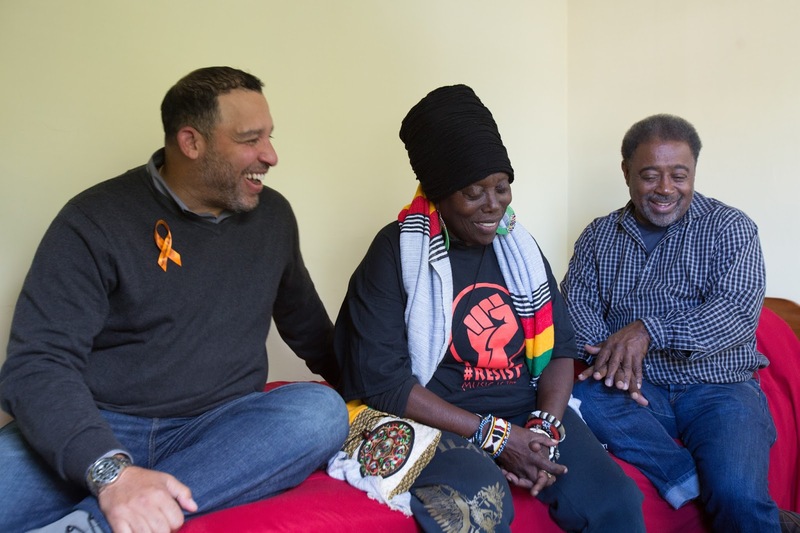 It is a well designed, well-oiled machine that gets kids from the toughest, inner-city neighborhoods to believe in themselves and understand the strength, knowledge, and beauty that lies within. Camp Compass welcomes kids who come from broken homes and may have few adults believing in them -- kids who may have given up. 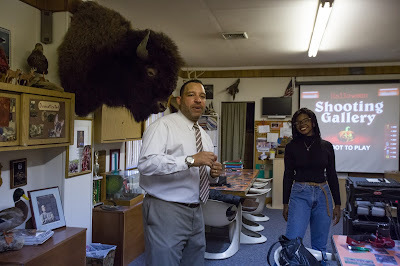 The program is rigorous and academically challenging, while prioritizing messages of self-acceptance, love, and a belief that they are capable of achieving absolutely anything. It becomes home for the long-haul. By interspersing knowledge about hunting, fishing, gun safety, and the outdoors, with math and writing, the students earn trips out into the woods. The kids stay laser-focused on the end-goal and are determined to succeed. When asked what they like best about the program, they all say that getting outside into the woods gives them peace, freedom to be themselves, and strength. The students talked with pride about their knowledge of gun safety (and indicated how many kids their age have access to guns with little knowledge about safety), and about how they feel accepted just as they are. The youth are well spoken and focused on the future. Their love for John and for the program is clear! Camp Compass is a program like no other - and we are proud that this community-based organization and its remarkable leader are part of our work to increase equity and inclusion in the sciences, conservation, and environmental programming. Our research is led by fifteen community leaders from historically underrepresented communities in the sciences. They lead community-based participatory research in collaboration with the Cornell Lab of Ornithology and have engaged a total of thirty community-based organization perspectives to better understand equity, diversity, and inclusion in citizen science. The questions, methods, analysis, results, and dissemination are determined by these researchers. They began their work three years ago out of frustration that their community voices were remaining unheard in the sciences and a strong distrust of dominant culture institutions that hold the balance of power and have been called on by funders to solve problems in their communities. This work has been supported by the National Science Foundation (NSF DRL#1422022). The ICBOs met in Philadelphia this past week and we got a lot done! We'll be sharing lots of details about the meeting soon! We worked on mission and vision, rules of engagement, and priorities for the next few months. We're excited about next steps. The ICBOs take over Philadelphia! 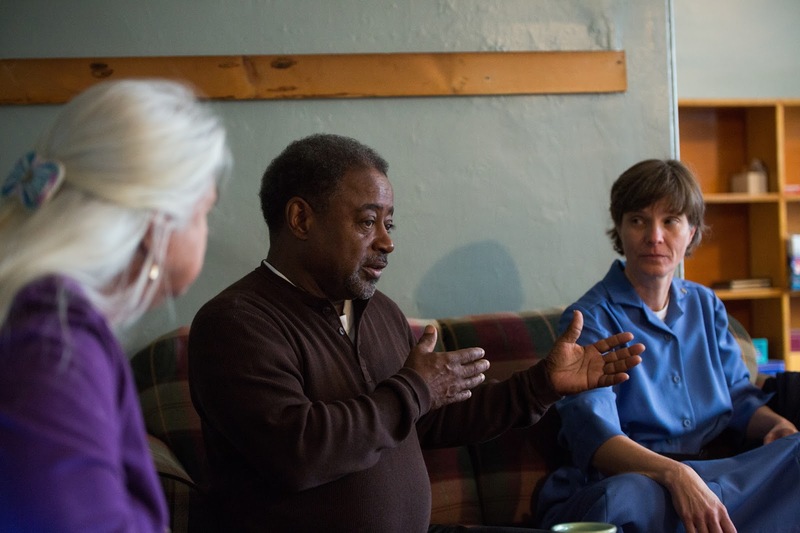 We just finished a fantastic meeting at Sister Sharon's St. Vincent de Paul Young Adult Center. We are charged up and ready to go. Each member of this team makes our group stronger and our work better. Everyone tells it like it is-- and expects the same from others. Feeling very grateful!